When Daniel and SG-5 visit P4X-347, they return to Earth experiencing severe physical and emotional symptoms. Lieutenant Barber commits suicide, and Daniel and the others fall into a deep debilitating depression that leaves them near death. SG-1 investigates the planet and finds a strange Goa'uld temple containing a beautifully mesmerizing light, and the planet's only inhabitant, a young boy named Loran. 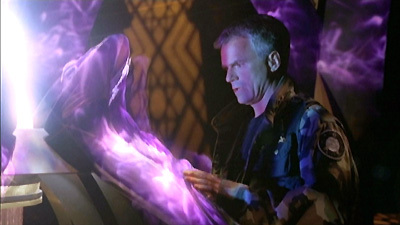 The light is strangely compelling, and as SG-1 are drawn to it, they begin to lose all sense of time. Yet its purpose, and its effects, remain a mystery. When O'Neill returns to Earth, he too begins experiencing the symptoms of depression, and tests reveal that a chemical imbalance is the cause. The members of SG-5 have died, and Daniel has slipped into a coma, moments from death. The answer appears to lie with the enigmatic light, and desperate to save Daniel's life, O'Neill carries him back through the gate to P4X-347. Once there, both men begin to recover, and it becomes apparent that proximity to the light's radiation causes euphoric highs, while distance results in critical withdrawal and death. SG-1 is trapped on the planet. Young Loran holds the key. Long since deserted, the temple on P4X-347 had once been a Goa'uld pleasure palace, and Loran's parents had been explorers who had come to the planet and fallen victim to the powerful addiction of the light. Only by avoiding the light had Loran eluded its irresistible hold. There is no escape, however Carter discovers that the intensity of the light can be adjusted. Time will provide the solution. As the light's effects gradually diminish, SG-1 and Loran will be able to safely return to Earth. The Goa'uld palace contained a pedestal which projects a light-matrix hologram onto the ceiling. It has probably been deserted for hundreds of years. A hidden device emitted undetectible energy or radiation. The color and light of the hologram interacted with the optic nerve and triggered chemical responses in the brain. Accelerated neural activity causes dopamine-like effects. When exposure ends, neural activity decreases resulting in depression. Addiction is almost instantaneous, with intensity proportional to the length of exposure. Addiction can be reversed by reducing the exposure incrementally over 2-3 weeks. A Goa'uld symbiote can keep a host's mind chemically balanced after exposure. SG-5 first visited the planet. Lieutenant Barber committed suicide by running into the stargate vortex. The rest of SG-5 suffered the effects of withdrawal and died. Loran's parents were explorers. They became addicted to the light, and when Loran turned off the device to free them, they went into withdrawal, ran into the ocean, and drowned. Loran returned to Earth with SG-1.